Millions of working people are exposed to hazardous noise levels every day, risking damage to their hearing. How then can they, and the organisations they work for, manage the risks they face? IOSH’s Michael Edwards examines the issue. Our hearing is something we often take for granted, but partially or totally losing our hearing can have a profound effect on our lives, both in work and in our private lives. There are many ways that our hearing can be adversely affected: from a temporary effect of listening to loud music at a festival or gig, to longer term auditory damage from unprotected noise sources in the workplace (such as noisy work equipment). Noise-Induced Hearing Loss (NIHL) is a condition that affects tens of thousands of people in the UK alone1. This condition is the only type of hearing loss that is completely preventable, but also one that cannot be surgically corrected. Therefore, to employers and safety practitioners it makes good sense, both ethically and monetarily, to control hazardous noise sources in the workplace. Some of the sectors where risks posed by noise levels are most prevalent include entertainment, manufacturing, agriculture, ship-building, textiles, mining and quarrying, food and drink, woodworking, metal working, and construction. It is difficult to specify what level of noise is absolutely safe, but what is certain is that noise levels above 75–80dB are known to cause hearing damage. Of course, each person is different. So, something that could harm the hearing of one person may not have such an effect on another. How then can employers test if their workplaces are too noisy? One simple test they can do is to see whether a normal conversation can be carried out at a distance of approximately one metre. If not, then it is most likely that noise levels are high. For a more accurate analysis on noise within the workplace, the use of equipment such as sound level meters allows management to understand in detail the levels and frequency of noise for a particular task or area. Competency on the use of these pieces of equipment varies depending on how accurate and detailed you want the analysis. For a quick ‘health check’ of noise levels, very basic training on a simple sound level meter will be sufficient, whereas if an in-depth review of noise levels in a workplace is required, a qualified occupational hygienist may need to be contracted to undertake this activity. In the UK the British Occupational Hygiene Society (BoHS) provide a directory of occupational hygiene services, available at www.bohs.org/ consultant. Other countries have equivalent organisations that can help with finding a qualified occupational hygienist. The length of time of exposure is also important. For example, noise levels at 85dB may take as long as eight hours to cause hearing damage, whilst noise at 100dB may start damaging hair cells in the ear much quicker. Most noise is produced from work equipment and processes in the workplace. Work equipment produces a wide range of noise levels. Worksafe New Zealand has produced a guide which outlines indicative noise levels for many types of work equipment. Many countries set occupational exposure limits for noise. These limits are usually expressed as an eighthour time weighted average (TWA). Although the limits vary from country to country, a generally accepted standard is a TWA of 85 dB(A). The A-weighting is applied to instrumentmeasured sound levels to account for the relative loudness perceived by the human ear, as the ear is less sensitive to low audio frequencies. As well as a TWA, many countries also implement an exposure limit value for peak sound pressure. This peak sound pressure is a limit that workers should not be exposed to and is not weighted by time. As stated earlier, whether it is exposure to an extremely high noise for a short period or to a low noise over many hours, noise at work can lead to irreversible or temporary hearing damage. One such impact is NIHL. While hearing loss is a condition that develops with age, it is also brought on and exacerbated by exposure to excessive noise. However, this can also be brought about by a sudden event. If someone is exposed to a very loud noise (usually over 100dB) for a short period of time – a condition known as acoustic trauma – it is more likely to be a chronic condition caused by continued exposure to noise over 85dB. Hearing loss isn’t the only condition caused by exposure to loud noises at work. Tinnitus, a ringing in the ears, is an early sign of hearing damage. This can have a knock-on impact of disturbed sleep and affected speech. As mentioned previously, there are also other risks associated with excessive noises, for example, distracted workers, people unable to communicate effectively, and even stress along with other health risks. As with all risks found in workplaces, employers have a duty to manage the hazards that excessive noise poses to workers. As with any other hazards, the risks of exposure must be assessed by ascertaining the likelihood of noise harming, and the severity of the harm to an employee or employees, considering any existing control measures in place. Once the risk has been assessed, a decision will then need to be made on whether the risk is considered tolerable or not. If the risk is not tolerable, further control measures will need to be implemented. When new controls are considered, a model called the Hierarchy of Noise Control can be used to prioritise the order that controls should be considered and implemented. This hierarchy is an approach that can be used to prioritise control measures to eliminate or reduce the risk of excessive noise exposure. Of course, every workplace is different, so there is no one-size-fitsall approach. Every scenario should be assessed in its own right. Once a risk assessment has determined that controls must be introduced to protect the hearing of employees, organisations must first look into whether the hazard can be eliminated – the most effective way of preventing the risk. As an employer, you should ask yourself if a particular task or activity which exposes employees to excessive noise needs to be performed. Could you also eliminate the impact between hard objects and surfaces? Can you outsource noisy work processes or move noisy operations away from other work activities? If this is not possible, then employers might consider substitution; for example, replacing noisy machinery with a quieter alternative. Our OH toolkit provides the following exemplar substitution methods which can help to reduce noise levels. If the aforementioned controls are not viable, employers should turn their attention to introducing engineering controls. This means making changes to processes, machinery or equipment to prevent or reduce noise exposure. Screens, barriers and enclosures, for example, can be used to reduce the impact of the noise on employees. Absorbent materials can also be introduced to help absorb the sound waves created by the impacts – noise dampening. Other means include: using conveyor belts rather than rollers; repairing and replacing loose rotating parts, worn bearings and gears; and undertaking regular maintenance on equipment, which is very effective in reducing noise emissions if carried out regularly. Administrative controls can also be considered to reduce the number of workers exposed to excessive noise and/or limit the length of time of exposure. Examples of elimination, substitution, engineering and administrative controls can be found on the UK’s HSE website as case studies. When all other measures have been considered and risks are still present, employers must consider using PPE. It is well known, of course, that PPE is at the bottom of the hierarchy of controls. However, there are circumstances when it is needed – when other controls cannot be introduced or if they do not fully eradicate or control the risk. How, then, should employers select PPE to protect the hearing of employees? Crucially, whatever form of PPE is selected, it must be capable of reducing noise exposure to the safe exposure levels and should be made available for workers to use. Attenuation is the term used to describe the process of losing noise energy. Hearing protection’s attenuation values are generally represented as single noise ratings or SNRs. Selecting the right SNR to reduce the dB level within the worker’s ear to below harmful levels is important as is ensuring that the hearing protection is effective for the frequency of the noise (usually termed high, medium or low). It is important to make sure that the hearing protection chosen to protect the workers is suitable for individuals’ working environments and is compatible with other PPE being used, for example, hard hats, dust masks and eye protection. It is good practice to offer different types of protectors so that workers can choose ones which suit them better. There can be one complicating factor, which could impact on safety: it’s important to remember that if the attenuation provided by hearing protection is too high, communication becomes difficult and individuals can end up working in isolation. When employers are choosing which type of hearing protection to use, they should use the results of their noise assessment, as well as information from PPE suppliers. 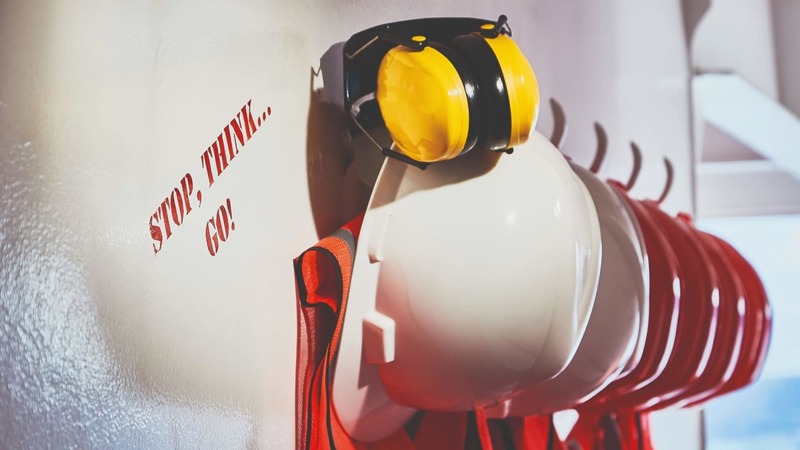 Once the most appropriate selection has been made and purchased, it is crucial to make sure that employees use it, including suitable training and/ or instruction to inform them about how to fit/wear the PPE correctly and the consequences of not using it properly. As well as selection, there is also maintenance of PPE. Non-disposable hearing protection must be inspected periodically for any damage and replaced if damage is found. Employers should make sure that hearing protection is available and well maintained, while employees are responsible for reporting any damage, defects or loss. European standard ‘EN352- 1:2002 – Hearing protectors. Safety requirements and testing. Ear-muffs’ provides further guidance on hearing protection devices. Dr Daphne Barker from the School of Health Sciences at The University of Manchester is part of a research team funded by Deafness UK detecting the early effects of occupational noise damage to hearing. Here, she explains how researchers are seeking to establish a more accurate understanding of the effects of excessive noise on humans. Exposure to loud noise is one of the leading causes of hearing loss, and thus presents a considerable potential problem for people who work in noisy environments. People who work in noisy environments are subject to regular hearing tests, in order to monitor any potential damage that might occur as a result of their job, and to preserve their hearing for the future. Hearing loss has been linked with cognitive impairment (difficulties with memory and thought processes), depression, social isolation and dementia in older adults, as well as other problems. Hearing tests are performed in sound-proofed rooms, and they measure the ability to hear tones of different pitches in silence. However, it is not very often in real life situations that we hear sounds in isolation. Usually there is some degree of background noise, and we are required to attend to a certain sound (for example, a person talking, announcements on a loud speaker, music, etc.) in a sea of other noises (for example, other people talking, motors running, background music etc.). The idea that hearing might be affected before any changes are detected on a hearing test is a hot topic in current research. Research on animals has suggested that when animals are exposed to loud noises for prolonged periods (or even relatively short bursts of excessive noise), some of the brain cells and connections between the brain cells that process sound information die. This does not mean that the animals will become deaf. It is possible to suffer significant cell death without affecting overall hearing function. However, it has been found that even when performance on hearing tests returns to normal levels after exposure to loud noise, these animals find it difficult to perform certain tasks that rely on the types of brain cells that are affected. If the same is true for humans, this would affect our ability to separate sounds in our environment (for example, speech in noise), enjoy music, and locate where a sound is coming from. Recent research from our laboratory has been looking at the hidden effects of noise exposure (i.e. those that are not detected using a typical hearing test) on humans, using various tests that assess different types of hearing and listening activities. Our aim is to test whether the effects of excessive noise on the human auditory system are similar to what has been found in animals, as discussed above. Our results have not yet been finalised, but what we know so far about how the hearing system works and how animals are affected by loud noises suggests that the typical hearing test does not give us the full picture about what is going on in our hearing system. It is possible that loud working environments affect our hearing in more ways than just the simple detection of quiet sounds in a quiet environment. It is in our best interests to make full use of the hearing protection that is offered in all noisy working environments (and noisy social environments where possible). In occupations where the environmental noise exceeds a certain level, hearing protection is compulsory, although not always adhered to. Our ability to hear speech in noisy environments affects our ability and desire to participate in social activities, among other things. It is therefore vitally important, in order to preserve our future social and cognitive skills, to protect our hearing. Michael Edwards is a Health and Safety Writer in the Information and Intelligence team at the Institution of Occupational Safety and Health (IOSH).